a MRI device without generating electromagnetic interference. The design of Model 900M-B MRI Head Holder Assembly allows easy access and removal from the stereotaxic base for insertion into an MRI device 12 cm diameter (or larger). Animals head position remains constant. Ear Bars – Model 955M MRI Non-Rupture 45° Tip Rat Ear Bars with fillable fluid marker tip (6.3 mm square with 20 mm of calibration). 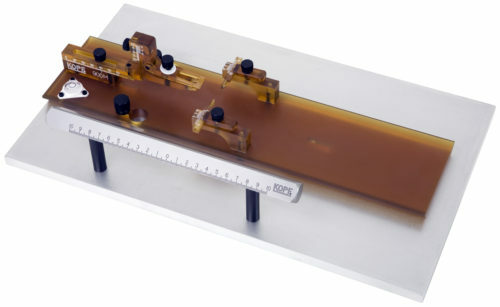 Another unique feature that this instrument offers are ear bars which can be filled with a reference fluid marker, such as Vitamin E or Mineral Oil. Ear bars have removable extensions. Once the animal is properly secured within the head holder, the back of the ear bar can be unscrewed and removed, this will assist when loading MRI head holder into small diameter MRI devices. Quality, versatility and ability to perform are guaranteed by David Kopf Instruments. with research quality and accuracy.